I'm going to be totally mean here and talk about how I eat in the winter and early spring in California. Oh goodness me but it is tough!! I mean, yes, we have citrus and asparagus and greens and potatoes and, in early spring, strawberries, but where for heaven's sake are the watermelon and corn? ;-) Just kidding!! We have a few year round farmers' markets but they are pretty sparse between Christmas and March. I did a Winter CSA this year and got a good variety of produce - with no where near enough potatoes!!! As to the bok choy, that did make me laugh. I've seen more than enough bok choy and carrots over the winter CSA to last me, well, until next winter. I sadly am just not eating a lot of fresh fruits and veggies -- we've occasionally broken down and bought the odd head of lettuce or two (because lack of greens makes me CRAVE salads), but I mostly am just looking forward to my garden and the Farmer's Market. Last year we tried a winter CSA, and by the end, my husband was like, "If I have to eat another sweet potato..." We also have a local produce delivery company similar to the one you describe. 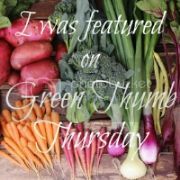 We tried it for awhile and although I liked the convenience, I didn't feel like it was a good value compared to what I can get at the farmers market. I'm just a farmers market kind of girl, and thankfully there's a year round farmers market here.